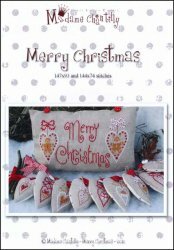 Merry Christmas [W6255] - $12.22 : Yarn Tree, Your wholesale source for cross stitch supplies. Cross stitch pattern by Madame Chantilly. Merry Christmas from Madame Chantilly contains two charts. One to make the pillow with the Gingerbread boy and girl. The other is for 10 hearts with 10 different Christmas designs. The hearts would make cute ornaments. Stitch count for pillow 147w x 91h. Stitch count for ornaments 43h x 25w.